(1) Big Ten is Done Expanding Until Notre Dame Changes Its Mind – For all of the talk about demographics, academics and TV markets, the Big Ten’s expansion process has been about three schools: Texas, Notre Dame and Nebraska. Those are the only schools that the Big Ten really cared about and anyone else would’ve been coming along for the ride. Now, adding Nebraska alone doesn’t really do much to address the demographic shift of the the U.S. population toward the Sun Belt. However, the indications that I’ve received are that the Big Ten’s appetite to add any Eastern-based schools such as Rutgers or Syracuse is very low unless Notre Dame is coming along, too. The financial barrier to enter the Big Ten as team #13 is much higher than Nebraska’s barrier to entry since any schools added from this point don’t receive the benefit of the $15 million pop from the addition of a conference championship game. Believe me – if the Big Ten was convinced that Rutgers and/or Syracuse could deliver New York/New Jersey households for the Big Ten Network, then they would’ve been added already. The problem is that they are not convinced and don’t believe that it would ever be possible without Notre Dame. Other markets, such the DC/Baltimore area that could be added with Maryland, are nice but not necessarily enough to justify a larger expansion. I’ve long said that it would take the equivalent of adding either the state of Texas or the NYC market in order to make a 14- or 16-school conference financially viable, so you won’t see the Big Ten do anything less than that if it attempts to expand again. (2) Entrenched Interests Don’t Want Superconferences – Another drag on the prospect of the Big Ten expanding further is what I believe has been a relatively underplayed aspect of the Big 12 Lite (or as some of the commenters have referred to, the “Big IIX”) surviving: a ton of entrenched interests in college football, including ESPN and Fox, worked to killed the formation of the Pac-16. This actually contradicted a common argument that I’ve seen stating that TV networks actually would rather have superconferences so that they can obtain rights to more marquee schools while dealing with fewer entities. If the TV networks don’t want superconferences to happen, and they are the ones that provide the financial basis of expanding toward superconferences in the first place, then that’s going to dissuade the Big Ten and other conferences from expanding beyond 12 schools (at least for the time being). (3) National Brand Value Trumps Local Markets – For all of the talk about TV markets and cable subscriber rates, expansion decisions really came down to a pretty basic calculation: which schools do Average Joe Sports Fan in Anytown USA want to watch? After Notre Dame and Texas, the consensus has long been that Nebraska fit that bill better than anyone. I’ve receive a lot of questions about how Nebraska could add financial value to the Big Ten compared to schools like Missouri and Rutgers that could bring in more households on paper. There are several factors at play here. First, even though a lot of focus has been on the Big Ten Network, the Big Ten still receives more TV money from its national ABC/ESPN contract than any other source. The Big Ten Network is really just a very strong supplement to that national TV income as opposed to a replacement, which is something that a lot of people have missed. Therefore, a school like Nebraska that brings in national TV viewers does much more for the ABC/ESPN side of the equation and seeing how the ACC and Big IIX are in line for larger paydays in their own contracts, Jim Delany must be salivating at the potential increase to the Big Ten’s deals by adding such a strong national brand name AND a conference championship game. Second, there is the advertising argument that Patrick set forth on this blog a few months ago. The higher the ratings, the higher the advertising rates can be charged. Now, there have been a number of questions about that analysis, but it needs to be coupled with the final point, which is that the oft-quoted $.70 per subscriber per month rate for the Big Ten Network in the Big Ten states is an average as opposed to an across-the-board rate. Cable providers in markets where there is extremely strong demand for the channel, such as Columbus, pay a higher rate than markets where there is weaker demand (i.e. Philadelphia). So, a lot of fans have made the mistake in assuming that the Big Ten Network could just automatically charge $.70 per subscriber in places like New Jersey, New York and Missouri simply by adding a school in those respective states. Fan intensity matters, and in the case of Nebraska, the Big Ten will likely be able to charge a higher subscriber rate in the Huskers’ home market than anywhere else. So, Nebraska’s 700,000 households might be much smaller in number compared to Missouri or New Jersey, but the flip side is that the Big Ten Network can effectively name its price there (i.e. an ESPN-level subscriber rate, which is the highest rate in the cable indsutry) and it will receive it. At the same time, since Nebraska games will draw more interest within the Big Ten footprint and nationally on DirecTV (where it is on the national basic tier), that positions the Big Ten Network to charge higher rates to its current households in its next round of negotiations. Please note that there were two schools in the soon-to-be-defunct Big 12 that looked seriously at starting their own networks: Texas and Nebraska. The former obviously has the households, but the latter’s fan base is so intense that they will pay any price to watch every Husker event. I’ve seen figures that Nebraska cleared about $2 million for every single pay-per-view game that it has offered, which is an insanely high number for any college football team regardless of the population base along with providing evidence that the Big Ten Network will get a massive subscriber fee in the state of Nebraska. Therefore, the Big Ten Network isn’t passing up on subscriber revenue in the manner that a lot of people who are just looking a population figures believe. Besides, Notre Dame is widely assumed to be an automatic money-maker for the Big Ten, but the Irish are also completely about national name brand value as opposed to adding actual markets. What’s good nationally for the Big Ten is good for the Big Ten Network. (4) Basketball Doesn’t Matter AT ALL – I think most of us understood that expansion and college sports revenue are football-driven. However, there was a small part of me that believed that basketball would at least be a minor factor (as evidenced by the fact that I made “Basketball Brand Value” worth 10 points out of the 100-point Big Ten Expansion Index scale). After Kansas ended up being passed around like a bad doobie and looked like it was Mountain West-bound for the better part of a week, though, it showed that absolutely NO consideration was or will be given to basketball in conference realignment. Adding Kansas to any league for basketball is akin to adding Notre Dame or Texas for football, yet no one cared. So, be forewarned if you’re a fan of a “basketball school” that might worry more about saving rivalries with, say, Georgetown or Duke instead of being concerned about how the football program is doing. Being in the best football conference possible is the only thing that can guarantee overall athletic program stability (even if you think that basketball in a particular conference might be “boring”). I know that a lot of the national sportswriters are not in favor of sticking Michigan, Ohio State and Penn State together in the same division, but I’m extremely wary of gerrymandering divisions in a way that could reduce the juice of a lot of natural rivalries. The main argument for moving Penn State away from Michigan and Ohio State is for “competitive balance”, yet trying to guess what would be the most “balanced” divisional alignment is a losing cause. The ACC attempted to do this by putting Florida State and Miami into separate division and then blindly drawing the names of the other schools out of a hat. The football gods voiced their disapproval by not allowing a Florida State-Miami ACC championship game occur even once so far even though the conference clearly jerry-rigged its divisions to do exactly that. The much-aligned and soon-to-be-defunct Big 12 North was actually the much stronger division in the Big 12 for the first several years of that conference’s existence. Meanwhile, the SEC was perfectly fine with having Florida, Tennessee and Georgia in national title contention at the same time while in the same division. With football play on the field being so cyclical, a divisional alignment that creates strong natural geographic rivalries is better in the long-term than trying to force an alignment that looks like a TV executive searching for short-term ad dollars put it together. Besides, Nebraska is a great anchor for the West division that’s going to draw national TV viewers and fill up stadiums no matter who they are playing. Wisconsin and Iowa are both top 15 revenue athletic programs while Illinois manages to put together a massive run once or twice per decade and then crush its fan base by horrifically underachieving for 5 years thereafter (rinse, lather and repeat), meaning that it’s more of “national brand” perception of strength in the East as opposed to being a real competitive disparity. Plus, I don’t think it makes sense for Penn State to be separated from Ohio State and Michigan, which are the two main schools that the Nitanny Lions care about playing (and from a Big Ten perspective, are the matchups that best leverage the conference’s exposure on the East Coast). As I’ve stated before, the SEC hasn’t had a problem with loaded geographically-friendly divisions before while the ACC has had massive issues with its “balanced” divisions, so the Big Ten shouldn’t think too hard about the division issue. A logical geographically pure East/West split is the way to go. (6) Chicago is the Best Home for LeBron (and I’m not just saying that as a Bulls fan) – OK, this doesn’t have to do with conference realignment, but please note that I’ve written more about Bulls trade and free agent rumors than any other topic over the years. After trading Kirk Hinrich to Washington (which will be effective July 8th), the Bulls can add one mega-star free agent (LeBron/Wade/Bosh) and one “next tier” free agent (Joe Johnson/Boozer/David Lee) outright. If the Bulls can clear about $3 million more in cap space (which would likely necessitate moving Luol Deng), then they can add 2 mega-star free agents. I’ve always had reserved optimism about the Bulls being a player in the LeBron James sweepstakes ever since a couple of weeks into Derrick Rose’s rookie season, but the Hinrich trade has skyrocketed my confidence level. The main argument that the Knicks had other than the lure of New York City was that it could sign 2 max free agents. With the Bulls now in the position to sign another top-of-the-line player besides LeBron on top of its young nucleus of Rose and Joakim Noah, I believe that Chicago is unequivocally the best pure long-term basketball destination for the King. The fact that Chicago is a great market is a bonus, yet that doesn’t mean as much as having a substantial upgrade compared to LeBron’s current roster in Cleveland. Up until the Hinrich trade, I thought it was 60/40 for Cleveland over Chicago in the competition for LeBron’s services. Now, I believe that it’s flipped around in favor of the Bulls. Cavs fans are pretty much resorting to emotional home-based arguments for LeBron to stay home and/or thinking that they can just sign-and-trade for a top-line player such as Chris Bosh. The former is a certainly a factor, but considering that LeBron would make more money if he’d re-sign with the Cavs before July 1st, I don’t believe that the “Cleveland/Akron = Home” angle is going to be dispositive. As for the latter, a sign-and-trade only works if the free agent target actually wants to move to Cleveland as opposed to signing with New York, Chicago and Miami AND the free agent’s old team actually wants to take back anyone (or more specifically, anyone’s contracts) from Cleveland, which is a lot easier said than done. If the three-headed GM monster of GarPaxForSonManDorf is able to land the biggest free agent in the history of free agency (and I don’t think that’s hyperbole), then this blog might have to totally shut down since I really don’t know what I’ll write about without conference realignment discussions or complaints about Bulls management. Regardless, the course of the entire NBA for the next decade will likely be decided within the next 10 days and I’ll be eating up every tidbit in the meantime. Before we get to talking about Notre Dame, the fate of the entire college sports landscape is being decided in Austin and College Station this week. Who knows if the Big Ten will ultimately be a part of this (I know that they are trying very hard), but I do believe this: Texas A&M would be insane to turn down an invitation from the SEC. I’ve thoroughly enjoyed all of my discussions with Texas fans over the last few months, but the prevailing belief among the Longhorn faithful that A&M would be making a mistake by taking that deal is complete nonsense. As much as I hate parroting the ESECPN talking points, the SEC has definitely been the top football conference overall for several years now. Its conference TV revenue per school today is larger than the projections for the proposed Pac-16, while A&M could also sell local TV rights on top of that. Financially and culturally, it’s a no-brainer for the Aggies. It puts its rivalry with Texas at great risk, but remember that Penn State gladly threw away its own Thanksgiving rivalry with Pitt a few years after joining the Big Ten. Remember that Pitt used to be considered Penn State’s equal not all that long ago. Now, Pitt is hoping for a Big Ten invite itself while Penn State rolls in revenue like few other programs. In this environment, it’s always better to be a member of a stronger and more established conference as opposed to trying to “control” a less stable and newer conference. If you had to bet your entire life savings, is the SEC going to be the more stable and lucrative conference in 10 or 20 years or is it going to be the new Pac-16? I would bet it all on the SEC, so how anyone could think that A&M would be making a mistake in choosing that option is being disingenuous. Now, I mentioned in a post last week that a Big East message board obsession might be coming true. In reality, it’s really more like 2 related Big East message board obsessions coming up to the surface: a mandate to Notre Dame and a possible split of the league. It had been my belief for a very long time that there really wasn’t anything that the Big East could tell Notre Dame (as I explained in this post looking at Big East expansion options a few months back). Well, it turns out that I may be wrong since there is a mechanism that has a lot of teeth (and it’s counterintuitive as to who is pushing the issue). A source with knowledge of the agreement that was entered into by the Big East schools following the ACC raid of 2003 states that in the event that 2 football members leave the conference, the football and non-football members can split the league without any penalty and retain their respective revenues, such as NCAA Tournament distributions. What is surprising is that the Catholic non-football members comprise the faction that is pushing the issue. If you recall, those schools met back in March to discuss “contingency plans”. Apparently, the Catholic schools have decided that they will exercise the split option if 2 Big East schools leave the conference (no matter who they might be) and have informed Big East commissioner John Marinatto as such. Financially, the Catholic schools would actually be in a fine position because they would have a large reserve of NCAA Tournament credits with Georgetown and Villanova having both made it to the Final Four in the last 4 years. There is also the stability and cultural fit standpoint, where the Catholic schools are not enthralled with the “usual suspects” of Big East expansion candidates from Conference USA. (In a side note, FedEx CEO Fred Smith has reportedly offered millions of dollars to a BCS league that would invite Memphis. Someone suggested to me that this type of offer could run afoul of Federal anti-corruption laws for inducing a public official, such as a public university administrator, to perform an official act. If there are attorneys practicing criminal law out there, let me know if that would be the case.) As much as the football members may complain about the hybrid model, the Big East is in a position where it will always need to leverage its basketball league in order to provide coverage for the football side. The Catholic schools are the ones that give the Big East an entryway into New York City, Chicago and Washington, so removing them actually hurts the football members more than the other way around. This affects Notre Dame from several different fronts. Externally, it’s still optimal for the hybrid to stay together for all of the Big East members, so Catholic schools like Georgetown may be willing to sacrifice its connection with Notre Dame in order to preserve the hybrid model and its basketball games with Syracuse and/or UCONN. This gives to teeth to the rumored pressure from the Big East on Notre Dame to make a decision on whether to join for all-sports. Even if there isn’t an ultimatum per se, the Big East is on notice that it will split up with the loss of 2 members without question. Therefore, if the Big Ten takes Rutgers and Syracuse, for example, it automatically forces the break-up of the Big East (where it’s not just a hypothetical threat). My understanding is that Notre Dame simply will not join an all-Catholic league for non-football sports when push comes to shove. Notre Dame’s alums may believe that it will be okay only because it would still be a pretty good men’s basketball league, but the problem is for all other sports. The athletic department size disparity between Notre Dame and the Catholic Big East members is the equivalent of USC or UCLA moving their non-football sports to the West Coast Conference. That’s just not going to cut it for an athletic department of Notre Dame’s size and stature, no matter how much its alumni base believes football independence matters more than everything else combined. That’s the angle a lot of people are missing: Notre Dame’s decision on conference membership actually has very little to do with football. The Irish can still keep its NBC contract and there really is no danger of the program being shut out of the national championship picture even if 16-team superconferences are formed. 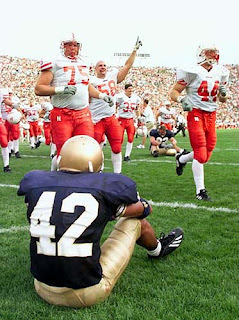 A lot of Notre Dame haters go overboard in arguing that the Irish are heading toward football irrelevance. In reality, Notre Dame has as strong of a fan base as ever and it’s shown every time that the team is halfway decent. However, the rest of the Irish athletic department will suffer a ton of damage if the Big East loses any members. Once again, the Notre Dame alumni base might be perfectly fine with throwing every other sport under the bus, but the leadership at Notre Dame won’t be. There is little rational justification to let that happen when the Big Ten offers more football revenue anyway plus a major reduction in travel expenses. The rise of superconferences might give Father Jenkins and Jack Swarbrick the PR cover with Notre Dame’s alums to make a move to a conference, but it’s really the terms of the Big East agreement combined with the stance of the Catholic membership that are putting the legitimate pressure on the Irish. I deal with Domers, Wolverines and Buckeyes on a daily basis, but I will say that there is no fan base that I have ever encountered that is as rabid and devoted as Nebraska fans. The discussions on this blog have only reinforced that – we’re getting fan base like no other. All of the Big Ten schools are going to be invaded by a sea of red sooner rather than later, as the Huskers are starting conference play in 2011. This is something that I noted was on the table a couple of weeks ago, where the Big Ten would provide financial concessions (such as a faster vesting of NU’s share of the Big Ten Network) in order to compensate for the higher 1-year notice exit fee from the Big 12. So, is this the end of expansion for the Big Ten or are we going to get the equivalent of the “Her Majesty” track on the Abbey Road album… or maybe an entirely new album added on? The Board of Regents of the University of Texas is discussing conference realignment on Tuesday. Despite what many of you may think, I’m a realist – if Texas A&M refuses the overtures of the SEC, then the heavy odds are on the creation of the Pac-16 with UT and friends. The situation, though, continues to be extremely fluid. There are enough dominoes in this game to keep this discussion going for awhile. In the meantime, congratulations to the University of Nebraska! It’s about time that the Big Ten had a Memorial Stadium that could sell out. (1) Add Texas and Notre Dame alone – If Texas A&M goes to the SEC (and it appears that the Aggies are hot and heavy with that conference with Oklahoma possibly behind them), then the Big Ten would stop at 14. This is actually the optimal situation for the Big Ten. (2) Add Texas, Notre Dame, Texas A&M and a team to be determined – If Texas A&M decides to join, there’s going to be a rigorous internal debate about who is school #16. Missouri, Rutgers and Syracuse, not surprisingly, are named as the most likely contenders for that last spot. (3) Add no one else – Same debate regarding Missouri, Rutgers and Syracuse (and maybe others) applies here, where the disagreement about who else could be added may result in the Big Ten only adding Nebraska and stopping at 12. My understanding is that Texas DOES want to join the Big Ten despite public posturing. I might have been throwing crap against the wall a few months ago about that, but I’m NOT now. Texas and the Big Ten have been dancing for a VERY long time in this process. 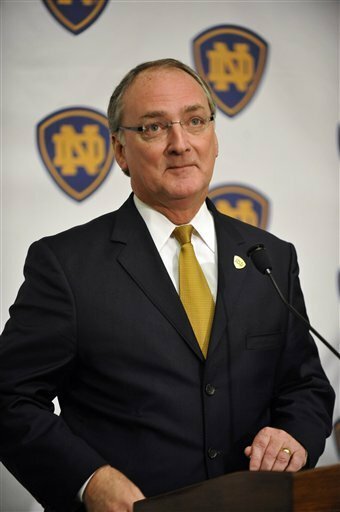 Also note that there are reasons why Notre Dame might be “forced” to join a conference that are different than the overall “seismic” shift that Jack Sarbrick has talked about. Namely, a Big East message board obsession has apparently come true. Read into that what you will. Former Texas A&M football coach R.C. Slocum, who now works as a special adviser to [Texas A&M President Bowen] Loftin, said football programs are carrying an increased financial burden to support other sports, so they’re drawn to potentially massive TV contracts for more revenue. “You look at the level of funding that all programs need to have, and it’s a business decision that universities now have to make,” Slocum said. Slocum said any decision A&M makes will be based purely on its financial impact, and not on more intangible elements, like preserving traditions and rivalries. The Texas A&M athletic department has around $16 million in debt, so if/when it gets an invite to SEC, it’s on the record that it’s not going to take a haircut in order to be in the same conference as Texas Tech and Baylor. So, if A&M asserts that it can control its own destiny, Texas has the moral/political authority to do whatever it wants. As I’ve argued from the beginning, the Big Ten makes the most financial and academic sense for Texas and my understanding is that the powers that be in Austin (the campus as opposed to the capitol) agree. Texas wouldn’t be publicly calling for the saving of the Big XII in order to start a Longhorn Sports Network only to head to the Pac Televen, where the projected TV revenue from the proposed 16-team league doesn’t even match what the Big Ten (and for that matter, the SEC) provides to each member today. Something is amiss there and I hope some journalists put aside their personal assumptions about what “should” happen and attack that angle seriously over the next few days. Whoever does is going to end up with the scoop of the year. In the meantime, as JB Kirby that runs the506.com (of NFL TV Distribution Maps fame) said today, this a special moment in history where the Big Ten, Pac-10 and Big 12 all have 11 members. Enjoy it because it’s not going to last for long. Any other evening I’d be writing a full blown expansion post considering all of the news and speculation today, but the mighty Blackhawks have just won their first Stanley Cup in 49 years!!! It was a little weird that Patrick Kane was the only person in the building that realized that he scored a goal for about 5 minutes, but it more than worth the wait considering that Chicago hockey fans have been suffering for five decades. A tad over 3 years ago, I went to a Hawks-Red Wings game with one of my buddies where the United Center was about half full and the majority of people that were there were Detroit fans. Yet, Rocky Wirtz has been able to completely reverse what seemed to be irreversible damage that his late father had caused to its fan base. I wrote this piece last year about the Hawks being the “Prodigal Franchise” of Chicago and how it has gone about regaining an entire generation of lost fans. Well, those fans definitely aren’t lost anymore. As I sit here in my Blackhawks sweater tonight, I’ve been able to witness arguably the greatest NFL team ever (the ’85 Bears), the greatest set of basketball teams ever (the ’90s Bulls dynasty), my baseball team crush the Curse of the Black Sox (the ’05 White Sox), an Illini berth in the national championship game (with the ’05 Elite Eight comeback game against Arizona that was the most unbelievable sports event that I have ever witnessed) and now a Stanley Cup. Heck, Illinois might retroactively win the Rose Bowl that I attended 2 years ago depending what sanctions get hammered on USC. Looking back, the Sports Gods have blessed me beyond belief. Plus, we’ve got many more years to enjoy Patrick Kane and Jonathan Toews. Congrats Hawks!!! Reports all over are confirming that Nebraska has been invited to the Big Ten, including the Chicago Tribune. Most of the regular readers of this blog established fairly early on that Nebraska would be the most likely school to be invited to the Big Ten and I’ve been getting info for awhile supporting that. It can’t be that simple, though, right? If you’ve been following my Twitter feed (@frankthetank111), I had a brief interaction with @FakeJimDelany where he asked me whether I had bugged his phone, to which I replied, “I only get my info from Northwestern message boards.” Well, the Northwestern message boards put up another doozy of a rumor tonight: in addition to Nebraska, the Big Ten will be offering invites to Texas, Texas A&M, Notre Dame and Missouri. The Missouri invite, however, is contingent upon either Texas or Notre Dame accepting. Who knows how this is going to play out and whether the Big Ten would truly hand out invites (or more specifically, asking the candidates to fill out the applications for invites) without knowing whether the answer is yes, but I do know that the poster (who had written the infamous post that reportedly sent Jim Delany flying off the handle, was removed for a couple of weeks and is now back online) has a legit and direct connection to the Big Ten office. So, if this offer is true, the choice for Texas is what I laid out in yesterday’s “Double Chess” post: the comfortable Kia of the Pac-10 that won’t upset its Lone Star neighbors or the Rolls Royce of the new Big Ten. Regardless, Chicago is the center of the sports world on multiple levels for the next few days. The Blackhawks are bringing the Cup home. Let’s see who Jim Delany ends up bringing over to Park Ridge. Multiple sources have told me that Notre Dame, Missouri and Nebraska are all poised to receive invites from the Big Ten. An announcement could come as early as Wednesday, with other projections looking toward before the end of this month. Of course, this scenario has been rumored on message boards over the last day, so whether this is a legitimate deal remains to be seen. With the Big Ten’s past experiences in attempting to invite Notre Dame, nothing can be guaranteed until Jim Delany and Father Jenkins make an announcement together. Note that I stated Father Jenkins, who has to make the ultimate call for the Domers, as opposed to Jack Swarbrick. There are a few takeaways from this formulation being put out there. At the top, if Missouri gets an invite to the Big Ten, it will have Notre Dame to thank. Without Notre Dame, the Big Ten would not have an interest in breaking up the Big XII and pushing Texas to the Pac-10, so it would likely have only invited one school to the immediate west: Nebraska. Indeed, Teddy Greenstein from the Chicago Tribune put up some analysis focused specifically about the prospect of Nebraska going to the Big Ten and he’s not going to be just engaging in idle speculation at this point in the game. However, if Notre Dame is in the fold, then the Big Ten does not have as much of a need to go after Big East schools (even though it still might) with the heavy Irish fan base in places like the New York area. A lot of the demographic factors that might have tipped the edge toward a school like Syracuse over Missouri without Notre Dame included would now be switched around. At the same time, it allows the Big Ten to make one last massive power play. The most interesting comment that Jim Delany had in his press conference was that this could be a multi-phase expansion for the Big Ten. This sounds a whole lot like attempting to build a Super Death Star Conference. I’ll explain that in a moment. The Pac-10 hired an interesting choice to analyze its expansion options: Creative Arts Agency, the high-powered Hollywood entertainment industry firm. Contrast this with the Big Ten, who has been using investment bankers to perform analysis. In a slightly off-topic note, CAA also represents LeBron James, which means that entire worlds of college sports and NBA basketball are probably going to determined by a line of cubicles in LA. What is CAA all about? Package deals. The franchise that gets LeBron isn’t just going to be able to sign him based on the quality of the existing team in place right now. Otherwise, there are only 2 choices for him in that scenario: staying with Cleveland or heading to the Chicago Bulls. On paper, the Clippers might have the talent, but that’s ignoring the fact that every good or decent player in that team’s history has broken a leg, torn an ACL or lost the use of both knees within a month of joining. The Knicks and Nets shouldn’t even be in the discussion. Instead, LeBron wants “his team” (meaning all of his handlers that don’t add value to any franchise) taken care of. So, it’s not a surprise that the Pac-10/CAA is approaching Texas, the equivalent of LeBron in the conference expansion sweepstakes, with the idea of selling the school a package. (Another sports columnist made that LeBron/Texas comparison but I can’t find the applicable article to give the appropriate credit. I’ll put up a link as soon as I can locate it again.) If this were about making the most money for Texas, then there are only 2 real choices for the school: the Big Ten and SEC. The proposed Pac-10 expansion is projected to only hopefully match the per school revenue that the Big Ten and SEC members already enjoy today. CAA understood that it couldn’t win the financial game for its client, so what it recommended the Pac-10 to sell Texas is “comfort”. It’s all about making it as easy as possible for Texas to make a move: politically expedient, easy travel companions and keeping all of its Big XII South rivalries on the conference slate. Who cares if the Pac-10 has rejected the notion of adding BYU for many years based on religious grounds and then all of the sudden has Baylor fever when Texas is now an option. (I have nothing against Baylor, but shame on the Pac-10 if it adds that school while turning its back on BYU for so long.) It’s like buying a Kia – you’re not going to break the bank, it’s certainly better than the used Ford Pinto of the Big XII that Texas is currently driving, and it won’t upset the neighbors in Waco and Lubbock. This can only mean one thing for the Pac-10: it’s inviting LeBron to become a member, moving its conference headquarters to Akron, and John Calipari will be installed as the new commissioner. Worldwide Wes will get it done. The Big Ten has to be true to its brand – its selling point to Texas is to be the highest class academic and athletic conference top-to-bottom. It can’t and shouldn’t try to get into a fight with the Pac-10 on concessions on the low end. If Texas can’t fend off the legislators or the school actually would rather be part of a provincial Eastern appendage to the Pac-10 or keep the Big XII as opposed to joining the top national conference, then it is what it is. At that point, Jim Delany just has to say, WTF and make his move. Looks like the University of Pittgers!